I'm researching an MQ Triton purchase and interested in bigger tyres. The issue of legallity has been raised in other helpful threads and all posts only mention diameter increase, 50mm in some states, 7% in NSW. However, in NSW, the regs also say you can only increase the tyre width by up to 20mm over the largest size on the placard. Wouldn't this limit the tyre width to 265 in NSW at least? Thanks in advance. I wonder why you would want to go wider than 265mm on a Triton? Consider extra wind resistance (fuel economy), more weight (fuel economy, performance hit, extra wear on suspension components) not to mention tyre clashing with the body work. I'm actually looking at 235/85/16 as my preferred options for all those reasons. It's just that other threads were talking about 275 and 285 tyres as legal and I was curious. Do you have to ride the clutch a bit in those conditions to get her going ? Much like the MN with same diameter tyres? snakesoup wrote: Do you have to ride the clutch a bit in those conditions to get her going ? Much like the MN with same diameter tyres? It’s like a button clutch in it releases suddenly and not intuitively, so sometimes you account for it and roar off, other times you account for it and it stalls- lots of fun with the taller tyres and hilly terrain. Easier on site to grab low range which with the reduced low range ratio works well. FYI. I was running BFG KOs in 265/65r17, and they didn't rub. Have just gone to KM3s in5/75r16, which are approx. the same diameter, but theoretically 20mm narrower. I'm in Vic so the 265/75r16s aren't legal due to being a tiny bit over the allowable 50mm increase in diameter. 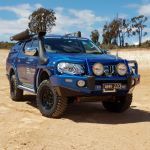 GLS MQ Triton, ARB Summit front, rear and side bars, Carryboy canopy and rack, Dobinson heavy duty suspension, Harrop rear E-locker, Drifta drawers and a few other bits and pieces. I went 265/70/16 on stock steel rims. Kept it legal, with a larger footprint and slight lift. Better off-road without too much extra weight or other negatives. I’m in Vic.